First you will ride along the majestic estuary of La Loire before reaching the serenity of the beautiful peninsula of the Pays de Retz. South Britain and the Jade coastline offer sandy coves, jagged cliffs and picturesque hamlets. Varied landscapes and pure sea air will be your fellow mates along this route . Charming seaside resorts as Pornic the flagship city on this coast, the marshlands in Vendée, the Island of Noirmoutier, a gem in this region for thos who love preserved nature. The Côte de Lumière (Light Coastline) goes on through forest and sandy dunes up to Les Sables d’Olonne renowned for its fine sandy beach, up to La Tranche sur Mer another popular sea resort. Your cycling holiday will end in La Rochelle that you reach through the ancient Marais Poitevin (marshes), a protected area. All along your holiday you will enjoy several culinary specialties like seafood platter or the delicious potatoes from Noirmoutiers . You will be warmly welcomed in 2 or 3 stars hôtels or in charming guest-houses. The Velodyssey is a 80% flat and fully signposted route, mostly on secured greenways. You can customize your trip and cycle it from top to bottom or in small portions, from 8 days to 3 weeks, from Nantes to Biarritz. West capital and certified «City of Art and History » Nantes will seduce you with its historical and cultural heritage : the « Château des ducs de Bretagne », the « Machines de l’Ile »,the « Jardin des Plantes » one of the 4 major botanical garden in France. 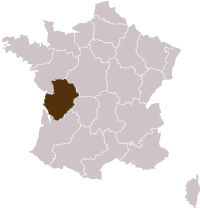 You leave Nantes along the Loire River estuary. We recommend a first stop to explore the maze of alleys that allow you to enjoy beautiful colorful houses which is uncommon in the North West of France. You then cycle along the Loire river and follow the Canal de la Martinière. Flat roads make it easy to cycle to the ocean. You reach Saint- Brevin -les-Pins and the South Loire beaches. Breathe in the sea breeze! Your route finally takes you on the Atlantic coast. Saint- Brévin beaches lined with pines, charming sandy coves and the jagged coastline of the quiet Bay of Bourgneuf ,fishing ports and lsmall seaside resorts. 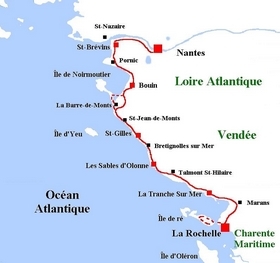 You follow the « Vendée Atlantique Oyster Road », and you won’t escape a tasting ! Plan to stay for a while in Pornic, before reaching the little village of Bouin by the Marais Breton Vendéen. the famous and mythical « passage du Gois », unique in Europe (remember to check the tide times the day before, the passage time is 3 hours per day, sometimes very early or very late) : road under the ocean of 4.2 km and praticable only at low tide (be careful not to slip on the cobblestones when the sea is withdrawing ! ), you are on your way to Noirmoutier. The little and preserved island with its d authenticity will delight you for sure! If the tide does not allow you to take the passage of Gois it will be by the peaceful and serene Marais Vendéen that you will approach this new stage passing by Beauvoir and its market town dating from the 17th century, and Saint-Jean de Monts. You will then follow the amazing cliffs and join the attractive city of St Gilles-Croix-de-Vie. You continue your trip joining Brétignolles and Brem by a cycle path without any complexity and with sea view. You will get away the seaboard to continue your excursion with a amazing landscape between the ancient salt marsh and the Olonne forest leading you until Les Sables d’Olonne where you take the benefit of a large fine sandy beach to relax and finish your day or visit and walk accross the little and charming streets of the city. Overnight in a 2 or 3-star hotel. Breakfast included. Your journey restart closer to the sea, the Vélodyssée weaves between forest and craggy coasts, making you discover amazing natural sites : Cayola Bay where you will enjoy a marvellous overview, the Point of Payré and its marshes, some lively ports like the Port of la Guittière, become oyster-farming village and designated a first remarkable site of Vendée. The pathway in forest permit you to take the advantage of the pines and holm oaks freshness before joining La Tranche sur Mer and its 13km of fine sandy beach. Overnight in a 3-star hotel. Breakfast included. On this last stage the Vélodyssée brings you through one of the last natural lagoon of the atlantic littoral, the lagoon of Belle Henriette. Very wild, it houses a lot of protected birds . The itinerary follows then the dryed part of the Marais Poitevin, by country lane and small roads. Before crossing the Sèvre Niortaise River and follow the canal an easy and quiet track leads you up to the Atlantic coast and the vibrant city of La Rochelle. Loop tour to the island of “Ré”, passing through the villages of “Flotte en Ré” (dating from the XVIIIth century) and its fishing boats, “Saint- Martin” with its fortifications and its fortress. You will walk along the oyster beds, salt marshes and the nature reserve of the “illeau Niges”. Back by “La Couarde” and “Bois plage”. Option Loop to l'île de Ré - 30 à 60 kmLoop tour to the island of “Ré”, passing through the villages of “Flotte enRé” (dating from the 18th century) and its fishing boats, “Saint-Martin” with its fortifications and its fortress. You will walk along the oyster farms, salt marshes and the natural reserve of the “illeau Niges”.Back by “La Couarde” and “Bois plage”.Overnight in a 3-star hotel. Breakfast included.